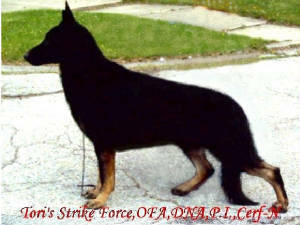 [ DUKES SON ]-RWD-2004-TORI'S STRIKE FORCE,OFA-GD,,DNA,Cerf-N,P.I. Meet our CH. Tori's Strike Force,P.I.,OFA,DNA,Cerf-Cleared, he is showing us great potential in 2 Competition Sports.The Conformation Show Ring and Personal Protection.He has a very Gentle Nature with a Terrific Outgoing Disposition,Wonderful Health and is OFA-GD. He has sired 4 beautiful highly intelligent litters with Heavy Bone ,Great Ears, Lots of Substance, Very Nice Movement and Very Sweet Dispositions To Date.He is Proven [ Black Factor- Low Ratio Depending also on female bred to ].His Sire is our Tori's Duke Vom Eskenbach,OFA,DNAP.I.,P.P.Cert and his Mother is the lovely Ketlyn's Fancy Finess.Strike began his Show career April 10-2004 [ he took his Group 1st Win and Reserve Winners Dog ] out of 12 to 18 Puppy Class at Steel City Kennel Club All Breed Show in Crown Point ,Indiana. He was Handled by Jeri Karam.That was a really good take for his first time ever being shown.His sister from the same litter Tori's Bagera took her 1st. Conformation Point out of 6 to 9 puppy class some months earlier. Check back often for updates on this big boys progress.Watch for this very happy boys Show results for 2005.His Pedigree is available below. Katja Vom Haus Darengo,Xray Normal 20 Mnths. Covy Tucker Hills MS Morgan,ROM PTS.